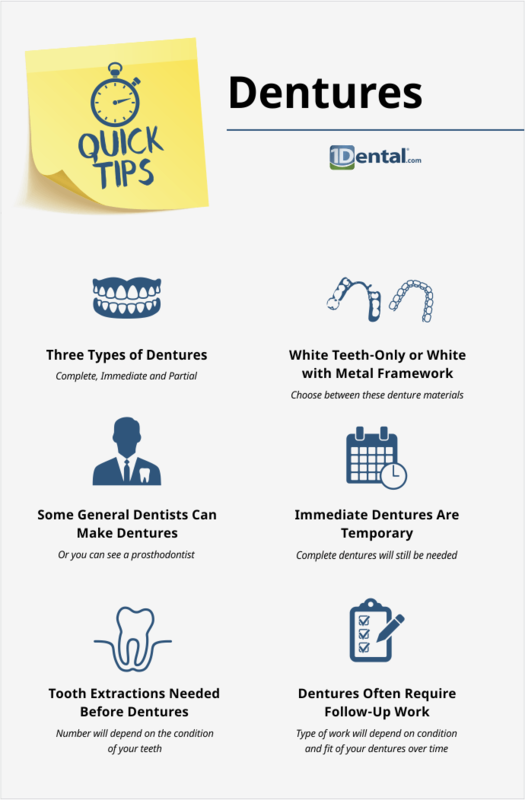 There are several different types of dentures--partial dentures for the upper or lower jaw, complete dentures, immediate dentures and adjustments that may be needed. Some general dentists make dentures in their practices, but you may need a specialist (prosthodontist) for this work, which will be less of a discount but can still offer significant savings with your Careington Care 500 discount dental plan. Dentist will determine if you need dentures. Dentist will take impressions of teeth to have dentures made. This may occur BEFORE and/or AFTER extractions depending on the type of dentures you get. The number of extractions depend on whether you are getting complete dentures or partial dentures and the condition of your existing teeth. You will be fitted for dentures following your tooth extractions (immediately or 6-8 weeks after teeth are extracted depending on the dentures you get). Adjustments will be made as needed.